Paper published in Nature Plants! You can download the pdf at https://www.nature.com/articles/s41477-018-0188-8Thank you all again for making this happen!! We have not just one, but TWO genomes! DNA en route to BGI! Awesome project! 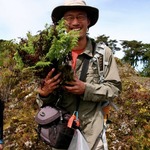 Please check out some epiphytic ferns for me! Good luck and enjoy the fieldwork! Wow! That's fast! Could you message (or email fl43@duke.edu) me your mailing address? Thanks! Grasses are super hard! I admire your determination! Yes! Of course! As soon as we have the data, it will be available through NCBI SRA. So did ferns save the world in the end? Thanks Andrew! You can also visit http://pryerlab.biology.duke.edu for updates about our research!